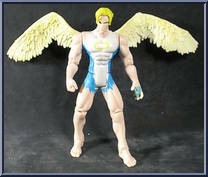 When transported to the Savage Land, Warren Worthington III found himself temporarily transformed into the mutant he once was, the high-flying Angel. Once again with his feathered wings, Angel soars to places no other X-Man can. High above the clouds is where you will find Angel and his Savage Land companion, Sauron-Dino. Together they strike from above on unsuspecting enemies with precision accuracy and lightning fast quickness. Contribute pictures, update details or suggest corrections for Angel & Sauron. Write a review about Angel & Sauron.